Class size: 9 min / 15 max. During studio time, landscape painters often use photographs, even if they have a plein air study of the location. When using photographs, it’s important to remember what the light and color was really like. 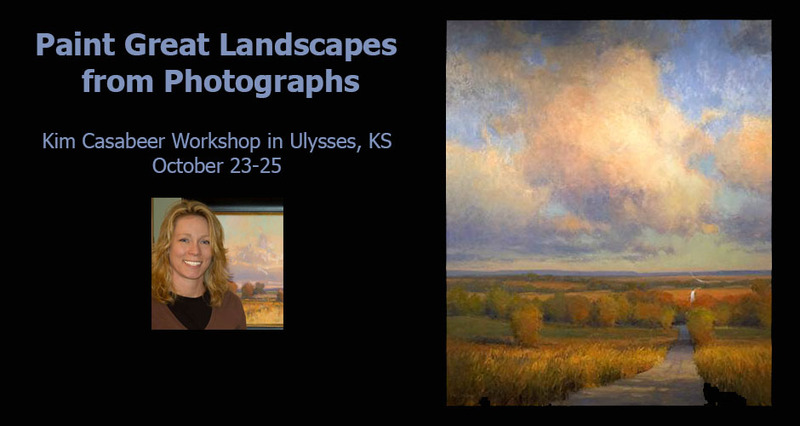 This workshop will concentrate on how to make good paintings from photos. We will talk about different types of light and shadow: light, highlight, halftone, shade, cast shadow, and reflected light. Value studies/notans and color studies will be emphasized in order to get the line, shape and value of the composition correct. Kim will offer demos and lots of individual attention at the easel. Kim Casebeer received her Bachelor of Fine Arts Degree from Kansas State University in 1992. She worked as a graphic designer, and in 2002 made the leap to full-time artist. Kim paints and shows her work across the country, including Wyoming, Arizona, New Mexico, Texas, California, Missouri and Kansas. She is a Signature Member of the Oil Painters of America and Pastel Society of America, and Master Signature Member of the American Women Artists. Her work has won national awards and has been featured in Art of the West, Southwest Art, PleinAir Magazine, American Art Collector and Western Art Collector.